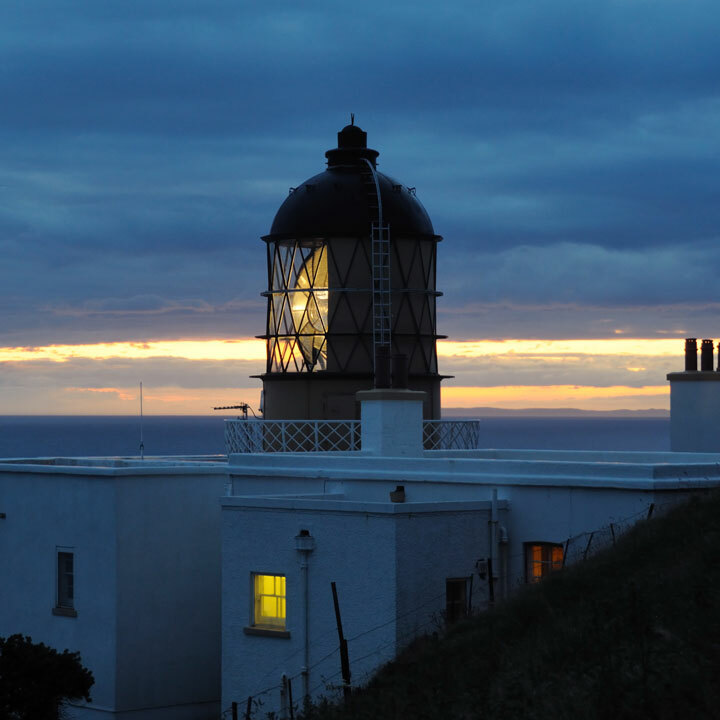 The Mull of Kintyre Lighthouse was built by Thomas Smith in 1788. The lighthouse was automated in 1996, when the light source was changed to a 250 Watt Multi Vapour lamp allowing the full service to be maintained by backup batteries during mains failures. The electric fog signal is 1km from the lighthouse and is monitored by a low power UHF radio link to the main lighthouse. All data from the lighthouse and fog signal is then transmitted to Northern Lighthouse Board Headquarters using the PSTN telephone network. Established in 1788, this lighthouse was one of the first to be erected by the Commissioners. The building operation was supervised by Thomas Smith, who was appointed Engineer to the Northern Lighthouse Board in 1787. Smith was assisted by Robert Stevenson. The lighthouse was built in 22 months and the light was first exhibited on the night of 1 November 1788. “This lighthouse was erected on a precipitous cliff 240 feet above the sea and inaccessible from it, but the rocky and desolate interior of Cantyre peninsula made the lighthouse site scarcely more accessible by land. Materials and stores had to be landed by boat 6 miles away and taken on horseback over the mountain with 1 cwt as the limited load. A single journey from landing-place to lighthouse represented one day’s work. After two working seasons, the light was shown in November 1788”. D Alan Stevenson is the great-grandson of Robert Stevenson, mentioned above, and his father’s cousin was Robert Louis Stevenson, the author. In 1782 an almost uninterrupted succession of storms, such as had not happened within the memory of man, struck the British coasts. Many fishermen could not put to sea, and in one “dark tempestuous night” two herring buses were wrecked in rounding the Kintyre peninsula, and many lives were lost. George Shield or Shiells, “a very careful mason”, was paid 4s 3d for his own work and for overseeing two other employed on building in Kintyre. Mull of Kintyre was a difficult site to build on, inaccessible by sea and as yet without any road over the rough moorland. The building, set 240 feet above the sea near the rocks known as “The Merchants of Three Pedlars”, was nearly ready by November, but to avoid risk to the lantern and apparatus during the winter, operations were held over until the following April. In 1817 the lighthouse keeper was granted an extra £5.00 a year in order to provide for the keeping of a horse which was necessary to carry the stores 7 miles from the storehouse to the lighthouse. Mull of Kintyre was rebuilt between 1821 and 1830 in a more permanent form, keeping with the Commissioners’ National Establishment Policy. It was equipped with a fog signal in 1876, sounded by steam or compressed air. The “Signal”, an iron paddle steamer built in 1883, had the misfortune to run on the Mull of Kintyre in dense fog in 1895 while on the way from McArthur’s Head to Sanda. The boats were at once launched and all on board, including one of the Commissioners, Sheriff William Ivory, were saved with most of their effects. Attempts to salvage the ship proved fruitless and she sank the next day. An official enquiry held that the ships lead should have been used to verify her position before altering course to round the Mull, but the Captain was not held in default and the whole question of the “periodicity” of fog signals was opened up, and it was suggested that a four minute interval between blasts was too long. Many changes have taken place since 1788. In 1906 the light was altered from a fixed to a flashing light, and the power increased from 8,000 to 281,000 candlepower. In 1976 the light was changed to electric and the candlepower increased to 1,575,000, by using a 3½ kilowatt electric filament lamp light source with catadioptric lens driven by duplicate electric motors.